haha I thought these were aimed at kids (because I was a fan of them and occasionally took to school for..well, lunch :p ). 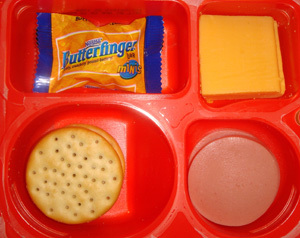 I’ve only tried Lunchables, but totally would’ve gone for the Lunchmakers, because of the Butterfinger, lol.. 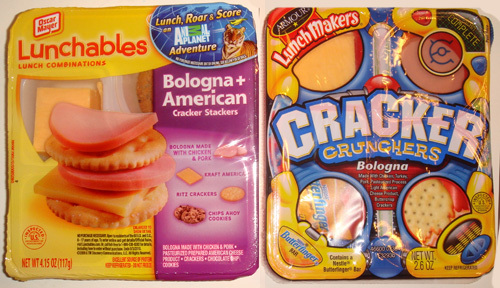 I do still think the cheese in Lunchables is better, it has a slightly less rubbery flavor to me. But the old-style butter crackers bring Lunchmakers over the edge. The crackers in the Lunchmakers are Keebler Toasteds which are a much better quality cracker than Ritz. Well oscar myer pretty much invented bologna, so if you dont like theirs you should not have tried the bologna kind b/c you must not be a fan of bologna. Try ham comparison and provide a review. 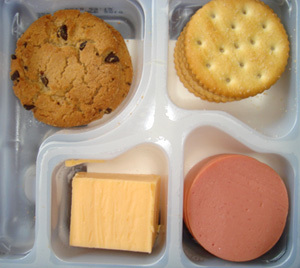 Lunchables is far better then thier imitators. I love nachos… but the cheese is disgusting! I agree on all aspects of this review!! My daughter will not eat the punishable. We buy Lunchmakers!! However sad that I can’t get the Bologna ones anymore we have to buy Turkey I stead. Lunchmakers all the way! They use real Pasteurized American Cheese. Cost is $1.00. Lunchables uses Cheese Product which is fake cheese and $1.36 !!! Can i continue my comment? Any CHEESE that says cheese FOOD or PRODUCT IS NOT(!) American Pasteurized Cheese. Thanx fr Wisconsin.